"I am FLABBERGASTED. That's all I can say...I am FLABBERGASTED. In fact, I'm changing my name to Flabbergasted. I like saying it so much. "It's astounding, a wonderful honor, and I thank you, the Classic Horror Film Board and the fans who voted and saw that the 'skeleton' had a heart." "As always, we couldn't have won this handsome award without the help of an extraordinary group of writers and artists who are always there for us. This is our third Rondo, but it holds special meaning for us ... it represents the year Tom Weaver brought us Donnie Dunagan, the year's most coveted interview, and our first Signature Edition. "It's a privilege to work with people of such quality and this Rondo embodies that sense of honor and spirit of cooperation. We're very grateful. Thanks to everyone who took the time to vote and support the spirit of the Rondo Awards!" "Just wanted to say how excited I am that we won the Rondo. You can be assured we'll be spreading the word whenever we're promoting The Black Forest!" 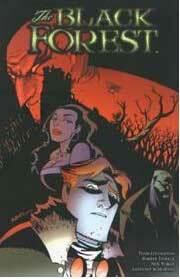 -- Robert Tinnell, co-creator of The Black Forest, Best Horror Comic of 2004. -- Todd Livingston, co-creator of The Black Forest. ''We are very happy that Chiller was recognized. I look forward to displaying the award! Thank you all." -- Kevin Clement of Chiller, voted Best Convention of 2004. "Thank you so much for the note and creating this vonderful award. I truly am humbled (at least a little) by winning it. "I vill keep it in a safe place, of that I can assure you. "May all your blood be warm!" 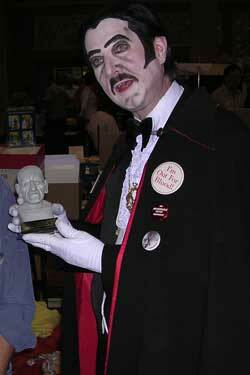 At right, the Count receives his award at the 2005 Monster Bash. Photo by Richard Olson, CHFB News. -- A friend of the daughter of the late William K. Everson, inducted into the Monster Kid Hall of Fame. "I wanted to thank you for including me in the awards. I had a blast painting the Chiller cover, it's that full circle thing from childhood to now. I love painting the classics and folks seem to like my take on them. "I am hugely influenced by my hero Basil Gogos. It was his art on the covers of Famous Monsters that I copied in crayon and colored pencil way back in the 1960's. I only wish I could paint those covers today. "It means a heckuva lot to me to be called Writer of the Year once again, and once again I want to share the honor with all the people who are VERY much responsible -- from the staffs of the various libraries; to my friends who offer to help every step of the way, right down to the final proof-reading; and especially the interviewees, who never seem to mind all the calls and my never-ending lists of questions. Without these people, I wouldn’t be writer of the year, month, week or even some random Tuesday. Thank you, everybody!" 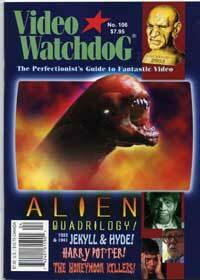 -- Tom Weaver, Writer of the Year; also a winner for Best Article (interview with lost Son of Frankenstein child star Donnie Dunagan in Video Watchdog. "I wanted to take this opportunity to thank you all again for the support! 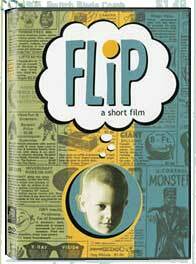 Flip, the short, continues to amaze us. "We are so glad it has touched so many people. Monsters Forever!" -- Todd Knowlton, producer of Flip, Best Independent Film of 2004. "It was a great night when we realized Flip had won. "Honestly, when it comes to statue design, the Rondo beats the Oscar any day. "Thanks so much for all the time and energy you've put into the Rondo Awards!" -- Kirk Demarais, creator of Flip. 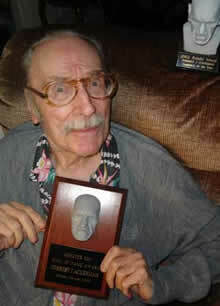 A youthful 89, Forrest J Ackerman sent along his best wishes recently after receiving the second of his two Rondo Awards at his birthday gala in Los Angeles. Here he is at the new Ackermansion holding the Monster Kid Hall of Fame Award, which was presented to him by science fiction fan and writer Bill Warren. Over his right shoulder is the 2002 Rondo for 'Best Comeback,' which he earned after recovering from illness. A big Rondo thank you to FJA friend, Joe Moe, who took the photo and emailed it to us!